This article was written by Mark Rejhon and remains here unaltered from its original form. As I am a hearing impaired individual, there are several benefits of the BlackBerry for the Deaf and for Hard Of Hearing. Most deaf users often go for the cheaper Hiptop/Sidekick because of instant messaging and better color screen. But today’s BlackBerries are now much better and more consumer-friendly, with screen quality to match nowadays. The BlackBerry is widely known to be one of the best wireless email and SMS device. Emails are instantly received and automatically displayed on the screen pager-style. No need to check email. No need to connect. Email comes in automatically. Much more reliable than Hiptop/Sidekick email, and you receive your emails faster with no delays and no lags like for Sidekick/Sidekick2/old 950. Wireless TTY Relay Services Galore! Relay services are interpretor-like services that translates voice to text and voice-versa so you can use the thumb keyboard to speak; to make voice phone calls. There are several wireless relay services now exist that works on BlackBerry, including Lormar Logic, AOL Instant Messenger Relay, MCI Wireless IP Relay, and Fuse Wireless. You don’t even need to buy a BlackBerry from a deaf provider anymore. No need to get Wyndtell brand; if you remember it. My favourite is MCI Wireless IP Relay, but requires an expensive telnet client called Idokorro Mobile SSH (Configure Idokorro to use hostname “wireless.ip-relay.com” and port “2510” for telnet protocol). You can do relay via WAP, via AIM, via SMS, and via telnet nowadays — which all are possible on BlackBerry! Even though most BlackBerries no longer provide paging included, you can still get paging-like services from a third party. The modern service today is a voicemail box that automatically has voice-to-text. This allows you to not need to explain to other people how to call you by relay service; they just call your voicemail and leave a message. And you simply read a transcription of your voicemails. Current BlackBerry models has a very good vibrating alert that vibrates more powerfully than most other cellphones. Vibrate alert works on everything — emails, SMS, alarms, and calendar appointment reminders! Your BlackBerry doubles as a vibrating pillow alarm that keeps persistently vibrating until you select Snooze. It is the most reliable travelling vibrating alarm I have ever found; even more reliable than other battery-powered vibrating alarms intentionally manufactured for the purpose of use by the deaf. If you need more powerful vibrating and are worried the BlackBerry will fall off the bed or out of the pillowcase, wear a long sock and slip the BlackBerry inside your sock before you sleep. That’ll do the job! Turn your Outlook Calendar appointments into a vibrating appointment reminder. BlackBerry is one of the best vibrating appointment reminders. Great for forgetful deaf people. There is more software for BlackBerry now than for Hiptop/Sidekick, including free software too. And you can even run Nokia/Motorola/Sony/Siemens Java phone software on BlackBerry now too! Midlets: You can use Nokia/Motorola/Sony/Siemens Java apps on BlackBerry! The recent models of BlackBerry are smaller and lighter than other wireless handhelds, making it more comfortable to carry around, which is a good bonus. An experienced thumb typist on BlackBerry can easily exceed 50 words per minute after practice if you are already a fast desktop keyboard typist. (On a BlackBerry, it is possible to thumb touch type staring at the screen and not the keyboard, after some practice). 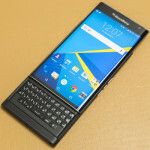 The fastest thumb typist went about 84 words per minute on a thumb keyboard, in the Dom Perignon III Contest run by Fitaly Inc.
On most modern GSM-network-based BlackBerries now, you can go away for a long travelling weekend without needing to recharge. 4 days, 5 days are not unusual for moderate always-on usage, 3 days for heavy usage with hundreds of emails and instant messages. Up to a whopping 9 days of very light usage! Yes, Hiptop/Sidekick is cheaper. But not as good. For more information, see BlackBerry versus Sidekick. All of this will work on all North American BlackBerries, regardless of who you buy the BlackBerry from. You may have to pay more money to purchase third-party services (i.e. you can get paging, relay, TTY, and voicemail-to-text services from another company separately from the network carrier). But the advantage is that if you ever switch between wireless devices, you can keep your existing services because they work over industry-standard methods such as emails, WAP, SMS, etc.